Are cyclists buses or taxis? We strongly welcome the Council’s initiative to take radical steps to make the city centre more people-friendly – and to get this in place before the tram opens to the public. Spokes has long lobbied for this – for example our Princes Street public meeting as long ago as 2009, chaired by the BBC’s Lesley Riddoch. But only now that the (new) Council appears to have tram finances and programming under control has it dared to look to a longer-term future. Unfortunately the Council’s initial proposal has truly shocked us, with its suggestion that cyclists in Princes Street should be treated as if they are buses or taxis – completely banned eastbound and with no choice westbound but to continue mixing it with buses and taxis next to the tramlines. This is totally at odds with the councils professed aim for 10% of all trips to be by bike by 2020, and with the Gehl report which helped inspire the Council to act. The planned 2-way segregated route in George Street is of course welcome and will be very useful for some journeys, but safe and welcoming permeable cycling throughout the central area is essential. The Council’s proposal, described and linked in an earlier posting, fortunately has now been described by senior councillors as purely an initial idea around which to focus consultation. At consultation meetings it has appeared that they are genuinely open to different ideas, depending on the feedback from the public consultation. Consultation ends on 9 May – please send in your views – see below. The full Spokes response [pdf 1.2MB] calls for Princes Street to be entirely free of motor traffic, except perhaps for an electric shuttle bus. Princes Street, Scotland’s premier street, with its shops, its fantastic backdrop and its huge potential, is currently dominated by noise and visual intrusion, quite unlike we would see in comparator European cities. Buses are absolutely vital to the city centre, but routes and interchanges could be reorganised, with remaining local Lothian cross-city buses mainly using George Street and longer-distance out-of-town buses mainly on Queen Street. The council proposal, to remove all motor traffic from the north side of both Princes Street and George Street, with 1-way traffic on the south sides, is a half-way house. It may be that Edinburgh is too conservative to go further initially, but just as the council removed private cars first on one side of Princes Street and a few years later on the other, so the current proposal would likely be the prelude to an eventual motor-free Princes Street. However, if the council does implement its 1-way proposal then two-way traffic-free bicycle use is absolutely essential in both streets. Cyclists, especially the many people who are currently scared to use a bike, need conditions which look and feel safe. The Council should not be catering solely for east-west through-commuter cyclists but for the many more people and families for whom Princes Street and George Street form multiple destinations – shops, gardens, banks, cafes, Waverley, etc, etc. These and many more reasons for making the whole area truly cycle-friendly are presented in our above submission – which is very much in line with the views expressed in our recent survey of Spokes members. It is vital for as many concerned individuals as possible to respond to the council consultation. By 9 May: Email your comments to citycentre.vision@edinburgh.gov.uk. Although the Spokes submission is long and detailed, yours can be short – just say briefly what is important to you, and why. By 9 May: Take the Council’s online survey www.surveymonkey.com/s/6G7MWW9. Note that some of the yes/no questions are really poor, but at least there is plenty opportunity to comment. Before completing it see our thoughts in Spokesworker 3.4.13. Look at the council’s current proposal here. [NB if this link is removed after May 9, you can still find the council consultation report on our city centre documents page – item 1303]. If you feel strongly, tell your councillors and ask them to support your views. Contact them via www.writetothem.com. Send us any useful replies. 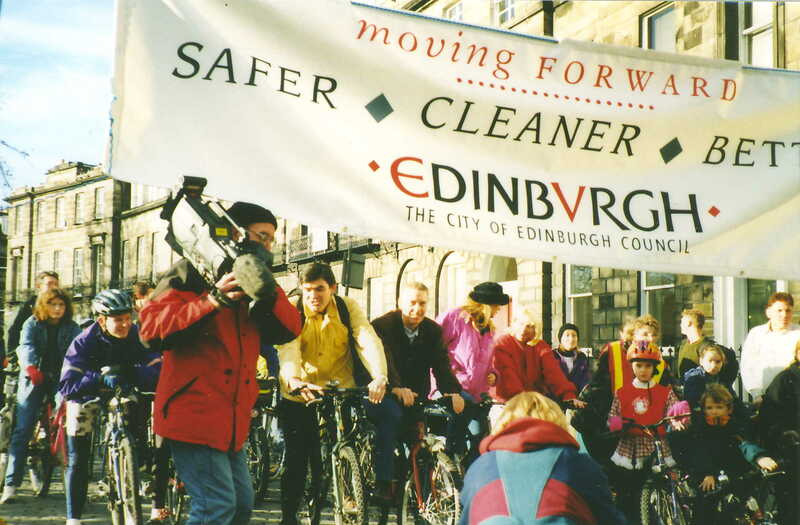 November 1996: Edinburgh City Council Transport Convenor Cllr David Begg proudly opens the new Princes Street cycle lane, accompanied by other councillors, four senior officials, and a proud Council banner. Will Princes Street still welcome people travelling and shopping by bike 20 years later? ?